Retired boxing champion Floyd Mayweather Jr. made his strongest statements yet about a potential fight against UFC championConor McGregor. "I believe the fight could happen. He's a tough competitor and has proved throughout the years in the UFC that he can fight standing up," Mayweather said in an interview with Showtime during a Saturday night boxing card in Las Vegas. "So we'll just have to see what the future holds. "Hopefully we can make the fight happen." Mayweather's comments came hours after McGregor spoke at length in Manchester, England. In a program called "An Experience with 'The Notorious' Conor McGregor," the UFC champion sat down for a wide-ranging interview with MMAFighting.com's Ariel Helwani in front of a live audience both in person and online, and he addressed questions about his past, his present and whether his future will include a fight with Mayweather. "That fight is being more than explored. That fight has been in the works for a while now," McGregor said. "It's a fight the people want. It's the fight I want." "The fans want this fight. The fans have been asking for this fight," Mayweather said later Saturday. "It's all about entertainment. He's very entertaining. He's very outspoken like myself. So let's give the fans what they want to see." Questions about the reality of a McGregor-Mayweather fight dominated McGregor's live interview, with McGregor saying he believes the fight "will happen by the end of this year or early next year." UFC president Dana White recently made a public offer of $25 million each to McGregor and Mayweather. However, appearing at UFC Fight Night in Denver on Saturday night, White was less than optimistic the two fighters will ever square off. "Here's what I think ... the chances are about the same as me being the backup quarterback for[Tom] Bradyon [Super Bowl] Sunday," White said. 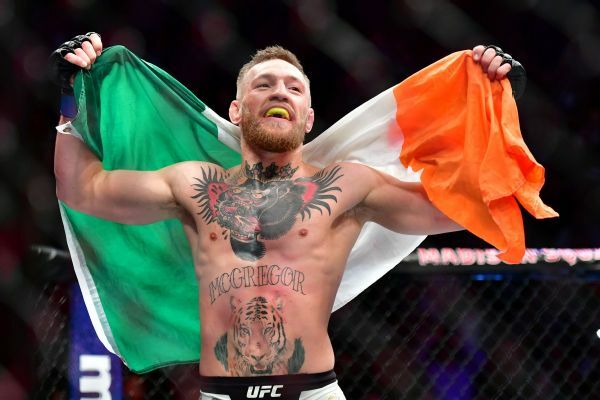 Regardless of White's outlook on the likelihood of the bout, the $25 million purses offered aren't enough money to get the deal done, according to McGregor. "I'm happy an offer was made. We're getting there," McGregor said. "... We're moving up. It's still not there yet, but it's closing in on it." "If [the] Manny [Pacquiao] and Floyd [fight] did half a billion, this is a billion dollar fight," McGregor explained. "People gotta pay for it." A former world champion boxer in multiple weight classes, Mayweather (49-0) is unlikely to be moved by the offer. He made a guaranteed purse of $100 million to fight Pacquiao in May 2015 in what remains the richest fight in boxing history. His most recent purse, to fight Andre Berto in September 2015, was a guaranteed $32 million. McGregor (21-3) is the UFC lightweight champion. He hasn't fought since he won the UFC's 155-pound title by knocking out Eddie Alvarez at UFC 205 in November. McGregor said that while the fight presents several logistical challenges, including settling on a fight discipline, making the bout happen is his primary focus ahead of any possible UFC fight. "The next time I fight, I will step through the ropes with ... gloves on," McGregor said, while noting that none of the possible fighters on the horizon (Jose Aldo, Nate Diaz, Tony Ferguson, Khabib Nurmagomedov, Anderson Silva, Georges St-Pierre) are enticing him to get back into the Octagon anytime soon. "I got my eyes on one thing and that's Floyd Mayweather," McGregor said. A more certain project on McGregor's mind is his pending fatherhood. The 28-year-old Irishman said his first child -- a boy -- is due in the coming months. While he maintains the prospect of being a dad has him a bit nervous, McGregor is certain his boy will follow in his footsteps. "The only time my records are going to be broken is by my own spawn," McGregor said. "I'm going be training that child out the womb." Information from ESPN's Brett Okamoto contributed to this report. ESPN UK round-up all of the days biggest sports news. In response to Conor McGregor's recent comments about a potential superfight between the two, Floyd Mayweather says it can happen and discusses what weight it could take place at.